Stefano Migliorini started riding bikes at a young age. He rode to emulate his older brother, a motocross racer. He started loving jumps and hills, and soon after, got into BMX racing. He was good at it, winning 10 Italian championships, 3 World Cups and 3 European championships. A brief stint in the military halted his career, but he picked up his two-wheeled passion once again as a downhill racer. He was one of the first Europeans to find a spot on an American team roster (GT Bicycles), and he competed against such downhill legends as John Tomac, Nicholas Vouilloz and Brian Lopes. His career highlight was a third overall in the 1993 Downhill World Cup. When his career ended due to an injury, he stayed in the dirt world, consulting for many facets of the industry. One of his close friends was the former manager of Honda’s MotoGP team Livio Suppo, who first introduced Migliorini to e-bikes, and it was then that the idea that became Thok was born. The dream was to offer riders of different levels and abilities to ride together. Thok was born of this collaboration with Suppo, along with a handful of other friends and associates, including 22-time world trials champion Tony Bou. 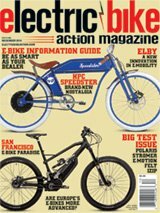 The e-bike line they’ve brought out is currently named MIG, short for “Migliorini.” The models range from the basic MIG-ST (short-travel 29er) up to the MIG-R and MIG Anniversary. What we’re looking at here is the original MIG with 140mm of rear travel and 150mm in front. The MIG is set up as an all-mountain bike, not set up as something more specific like an enduro ride (that would be the MIG-R). It uses a quadrilateral linkage layout with a Horst Link. The rocker arms are robust, and they use a four-bar system with a yoke-driven shock. The whole design is called TPS, or “Thok Progressive System.” Thanks to this design, the chassis torsions under load aren’t transferred to the shock, which helps with responsiveness and durability. The hydroformed aluminum frame utilizes large tubing for strength, possibly at the cost of slightly higher weight. The bike was designed to have a lower center of gravity and a wheelbase that makes it very agile. That agility is controlled by immense 780mm-wide bars. It features full suspension from RockShox with a Yari fork and a Deluxe R rear shock. Brakes are Shimano Deore with 203mm rotors. In a very interesting departure, with all the Shimano components down to the motor and brakes, Thok spec’d the bike with a SRAM NX drivetrain. Everything is clean, with most of the cables routed internally. It’s a matte-charcoal-colored bike with an optional accent color for the protective rubber and plastic battery cover. The stock battery cover is black, and this red one is included. Guess which one we liked better? Thok decided on Shimano for the powerplant, owing to the proven supply and reliability, as well as the tiny display and the mechanical “shifting” between power levels. The E8000 motor is one of the smallest and lightest in the industry, with a narrow Q-factor and 70 N/m of torque; it’s capable of flattening most hills. We especially like it because it’s tunable by the rider via an app. That’s a very good thing, because on most all bikes running the factory settings, Eco is fine, but Trail mode is set too low, followed by a massive jump to Boost, which really should only be needed for the steepest of grades. Our favorite thing is to hit the e-Tube app and push up Trail’s power to around the middle for most bikes. The MIG was no exception. The cockpit is really clean, thanks in part to the tiny STEPS display. It’s great the way they designed the mount to protect it. The mechanical shifter to change modes is one of our favorite features. Since most bikes these days run a 1x system, you can now have a shifter on the left side of your bars to match the right, where it would’ve been previously controlling a front derailleur. The 504-Wh battery is mounted underneath the down tube. This helps lower the center of gravity, stiffens the frame and frees up space in the front triangle for a water bottle. Thok has affixed a protective cage that surrounds the battery to help protect it, and you get two with the bike—a black one and a red one. Charging can be done on or off the bike. A proven Shimano STEPS E8000 motor provides 70 N/m of torque in a tiny, light package. Note that with the battery placement on the underside of the downtube, there’s room for a bottle cage. The MIG is aimed squarely at serious, all-mountain riders who like something unique-looking and want something that won’t break the bank. Steep climbs are a breeze, because the seat angle is so steep that it allows for better weight over the front wheel. We hit a few sections that are really steep on a local trail that sometimes causes bikes to loop out, and the MIG scampered up them in short order, and the saddle position made it much easier to keep our body forward and the front end down. Conversely, descending is a blast. The bike is so agile and dynamic, the suspension so plush and forgiving, it begs you to have fun! The 66-degree head angle feels perfect. It eats up the trail, making drop-offs seem like mere bumps, going right over roots, even making rock gardens seem like a pile of pebbles. Big 203mm rotors, front and rear, provide plenty of stopping power and good modulation. The 780mm bars are wide, but there were a couple of trails where we’d have preferred to shave them down a bit. This is, of course, rider preference. Better to start with ’em too wide than not wide enough. Good choice of tires, with a Maxxis 2.8-inch Minion in the front and a Rekon in the rear mated with 40mm-wide rims that give it grip for days. With plus-sized tires, the right air pressure is key for grip, and you can run lower pressure than you would with a narrower tire/wheel combo for tremendous grip. We were cornering like we were on rails. E-MTBs are heavier than their non-e cousins, which can also help in this department. This bike, with the battery mounted low emphasizing low center of gravity, does this extremely well. Braking is accomplished with Shimano’s XT two-piston brakes. When most everyone is going to four-piston setups in the front, the fact that Thok put the biggest rotors on both ends was to make sure we didn’t want for more. There seemed to be plenty of power and good modulation. It’s no surprise that this was built by a former racing champion. It definitely rides like one. Even more surprising is that it’s the first bike from a boutique brand. It has a great low center of gravity, supple suspension ad very controllable geometry. Stefano and his cohorts have done very well and at a price that you wouldn’t expect from a small brand.